Much like the author’s book on Crecy , this book is designed with the British tourist in mind. Agincourt is a battle which lives on in English history in particular because of the way that the English were outnumbered, especially in men at arms, and were simply trying at that point to get to Calais and back home when they were faced with a battle they had to fight and win in order to survive. The introductory chapter of the book does a good job at setting the battle within its historical context as well as presenting some of the issues faced with traveling in rural France. These include the fact that the tourist season is sometimes short in small towns and villages, that one’s travel by bike and especially by foot may be impacted by boar hunts or encounters with wildlife, and that the bus and train systems of rural Northern France are not precisely what an English traveler would expect and that transportation information can be difficult to come by. The author, as a result, does a good job at appropriately setting expectations for those travelers, especially English travelers, who wish to follow the trail of King Henry V and his army along the Agincourt campaign through the countryside. In terms of its contents, after its introductory preface, advice for tourists, and discussion of Henry V and the Hundred Years’ War, this book is divided into five different tours that start at La Havre, where Henry V disembarked in 1415, and end in Calais where his army successfully returned home to England after their victorious campaign. The first is from La Havre to the siege of Harfleur. After that the author looks at the march from Harfleur to Abbeville. The third tour takes the reader along the Somme River valley from Abbeville to Pèronne and then the fourth tour takes the reader from Pèronne to Calais via Agincourt. The fifth tour, as was the case in the author’s guide to Crecy, concerns the most likely battlefield itself. The trip is concerned with the survival of medieval structures, the preservation of legends about the battle or about the Hundred Years’ War and its impact on the various parts of the French countryside visited, and also about the influence of factors like politics, terrain, and logistics on the course of the Agincourt battle and its surrounding campaign, which was strongly influenced by such factors in complicated ways. For example, the author notes the inability of the French to concentrate along the Somme at all of the important points given limitations in transportation and communication, and remarks frequently about the swampy and muddy nature of much of the ground in the areas the campaign took place in. The author notes as well that it was the division of the French state and the occasional incapacity of France’s rulers that left France vulnerable to English invasion, given the fact that France was more powerful in terms of its economic and demographic strength and normally more than a match for English capabilities. Throughout the book the author takes considerable pains to point out that the trail shown is based on the most probable path of the army. Some of the stopping points are shown in the available texts, and there are some unreliable legends about the role of Henry V and his army in certain places, and the author does not overstate his certainty about where the army spent the night and which towns gave the English army provisions or information about fords in order to avoid looting and various depredations. Likewise, the author spends a great deal of time talking about the French army and its preparations and the complex behavior chosen by some French nobles who supported the Burgundians but also sent troops and supplies to the French royal force, and sometimes even died in the French army. The author is also rather interested in the dynamic interplay between personal factors and other contextual matters when it came to the way the campaign developed, pointing out the unwillingness of the French leaders to risk their king of dauphin in such a place where it was possible for a ruinous ransom to be laid on them as happened after the capture of French King Jean (John) II at the Battle of Poitiers. Most telling about the book and its subject matter is the contrast between the way that the battle has been immortalized in Shakespeare’s Henry V and the larger English historical memory but that the battle itself was not particularly decisive. France lost thousands of soldiers dead and captured, and the beleaguered state of the English army led to at least some of those prisoners being killed, but even among the captured magnates of the French army, of which there were many, the ransoms were not as large as expected and it took further campaigns before a peace was able to be made, one which did not last because Henry V was unable to outlive his French counterpart. 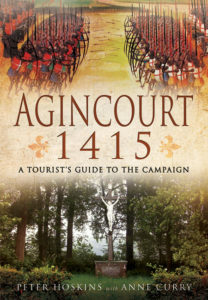 The author is wise to note that Agincourt was a successful and even glorious battle but one whose larger strategic results were not as notable, and the author does not attempt to sugarcoat the picture, presenting a guide to tourists that is in accordance with the latest scholarship about the battle, about which the author appears to be aware. This is a book that would be most of interest to English-speaking tourists who have a strong interest in Henry V’s phase of the Hundred Years’ war. This entry was posted in BookReview. Bookmark the permalink.